Please, Oppo. Tell me I’m not the only one who misses big V-10 thunder and massive SUV things. Please tell me that I’m not the only one who misses things that are so large, they should drop the S and just become Utility Vehicles. Please, tell me I’m not the only one saddened by the loss of this amazing vehicle, some ten years ago. By the loss of column shifters. By the loss of everything that should define the American SUV today. Help stop the abuse of the SUV market by designers who wish only to appeal to white, middle-aged suburbanite soccer moms who haul only children and not anything useful, but still bought an SUV to compliment their manicured lawns and marble houses, perfect shrubbery and black-dyed mulch, instead of buying a more reasonable, more efficient, and more practical minivan. Please. Join me, and we can give it our best shot, to bring about a better world. One full-sized, Utility focused, V-10 powered SUV at a time. 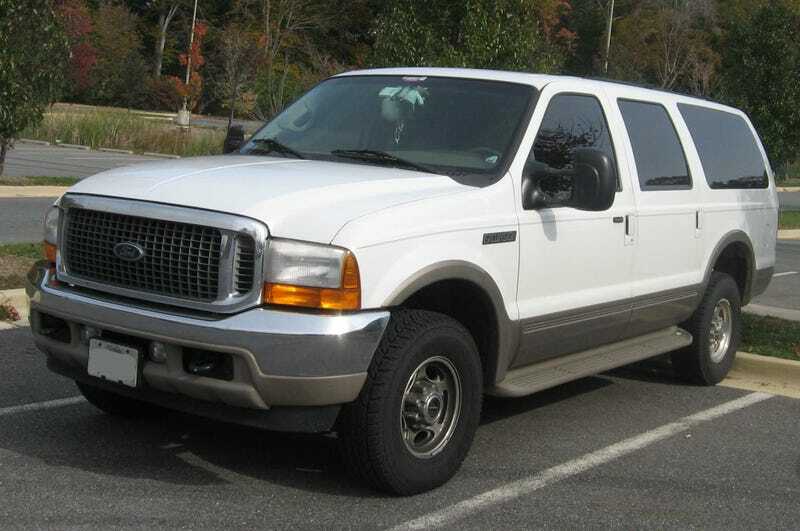 Hopefully, we can bring back the Excursion. And V-10s.